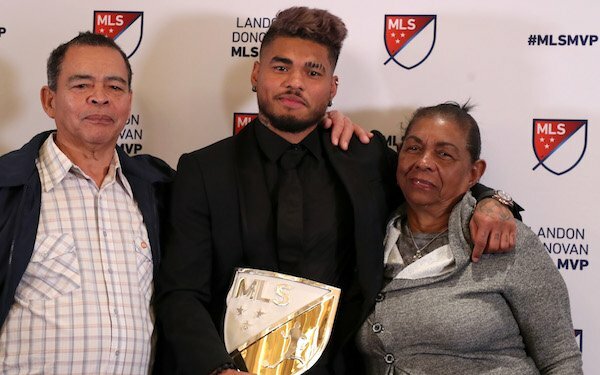 Atlanta United forward Josef Martinez, who set an MLS record with 31 goals in the 2018 regular season, was the runaway winner of the 2018 Landon Donovan MLS Most Valuable Player award. Martinez, 25, has helped lead Atlanta United to MLS Cup 2018, in which it will host the Portland Timbers on Saturday. The Venezuelan received his award on Wednesday at ceremonies held at the offices of Atlanta United owner Arthur Blank. Martinez needed only 25 games to match the previous record of 27 goals, shared by Bradley Wright-Phillips, Chris Wondolowski and Roy Lassiter. He also scored three goals so far in the playoffs to give him 34 combined goals in 2018, breaking the record of 33 set by Lassiter in 1996, MLS's first season. He also established a new MLS career hat trick record after recording his sixth hat trick in two seasons on July 21 against D.C. United. Martinez, who has scored 51 goals in 54 games, earned nearly 48 percent of the votes in the MVP polling of players, management and the media. He beat out Atlanta United teammate Miguel Almiron, who received 15 percent of votes. Zlatan Ibrahimovic (LA Galaxy), Wayne Rooney (D.C. United) and Carlos Vela (LAFC) rounded out the top five. Martinez is the 22nd MVP winner in 23 years. Only Preki (1997 and 2003) has won the award twice.